On March 10th 2009, legendary hip hop pioneer Grandmaster Flash releases The Bridge: Concept Of A Culture on Adrenaline City Entertainment via Strut, his first high profile studio album since his final recordings for Elektra back in 1988. "As a DJ, I've been blessed to see many different people, places and styles. The album title represents all the bridges I've crossed worldwide," explains Flash. "The bridges of time, cultures and colour, the bridges of hip hop, funk, pop, rock, jazz, punk, disco and R&B." Recorded at Flash's own Adrenaline Lab studio in New York during 2007-2008, the over-riding theme of the album is the global language of hip hop. "Wherever I travel as a DJ, I see the incredible power of this artform," Flash explains. "I am constantly amazed by it. That's the line that runs through the album - we speak many languages and come from many cultures but, wherever I go in the world, there is one universal culture of hip hop." Throughout the album, Flash mixes up the flow and features some heavyweight guests and intriguing collaborations. Familiar faces appearing on the album include KRS One, Big Daddy Kane, Busta Rhymes, A Tribe Called Quest frontman Q-Tip and Snoop Dogg alongside mixtape hero Red Cafe and Lynn Carter. Flash sets up an all-female soundclash between MTV favourite Byata, Hedonis Da Amazon and electro queen Princess Superstar for a Miami bass-style party joint. He presents his son, J-Flo on his debut recording alongside Def Jam MC Lordikim Allah and Almighty Thor. Last but not least, Lost Boyz' Mr. Cheeks teams up with old skool heroes Grandmaster Caz of Cold Crush Brothers and Tito of Fearless Four. Grandmaster Flash is one of the undisputed pioneers of hip hop. He is recognised worldwide as the first DJ to make the turntables an instrument, famously developing his 'Quick Mix Theory' mix techniques during the '70s which are now used by DJs the world over. Through his fabled block parties and, later, live shows and releases with The Furious Five, Flash was responsible for recording the first live DJ mix to be committed to wax and for masterminding groundbreaking live sets that lifted the bar for hip hop. Through his work, hip hop was first taken seriously as a sustainable artform that could both pack a lyrical punch and pull audiences on a par with traditional mainstream rock and pop acts. 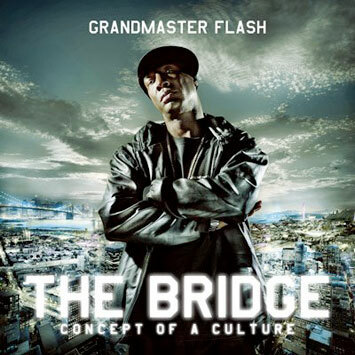 Grandmaster Flash The Bridge: Concept Of A Culture is released on March 10th 2009. In June 2008, the autobiography The Adventures Of Grandmaster Flash: My Life, My Beats was published by Random House, written by Flash himself and top author David Ritz. The book provides a valuable insight into Flash's early years growing up in the Bronx and his personal experience at the advent of hip hop culture. Flash was inducted into the Rock 'n' Roll Hall Of Fame during 2007. He endorses and uses the Traktor Scratch digital vinyl system - "the analogue inventor has gone digital".